2011 was yet another great year. The highlight was obviously the addition of a second little one to our family. This blissful year didn’t really carry over to the blog though. I have a back-log of grilled treats I would like to share since the grill was fired up quite a lot (not so much in the last few months). On the beery side though I really didn’t accomplish much, and my Golden Goblet picks reflect that. I had to drop several categories from last year because I simply couldn’t come up with any winners due to a “lack of entries”. Best Beer Graphic(s) – this was a tough one but I ended up going with the overall look of Red Brick Brewing’s new packaging. Too bad they didn’t carry these new graphics over to all parts of their brand, like their website. Work on that guys. Beer Retailer of the Year – Dranken Geers. They have really done a good job in getting some of the better rare stuff and some great non-belgians. All for a good price too. In 2012 I’d Most Like To – like last year, Brew on a real brewery system… perhaps another collaboration? 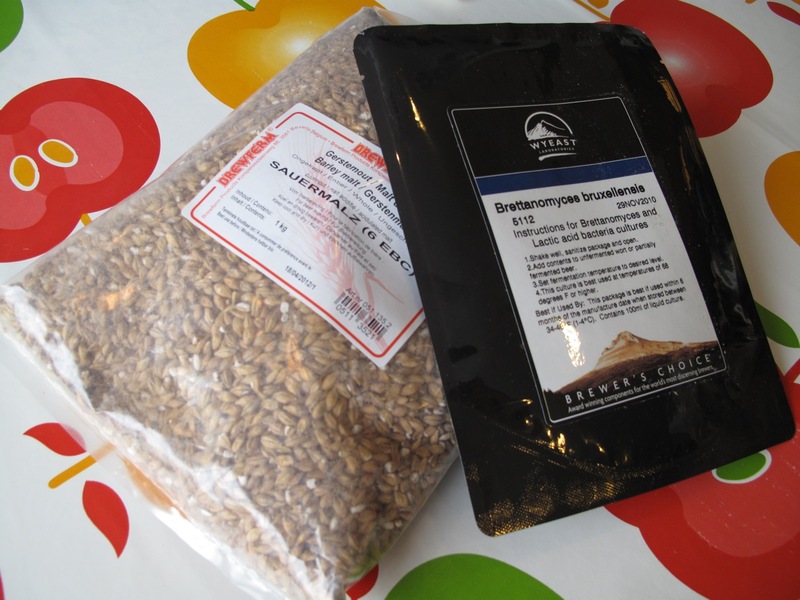 Open Category – This year the Open Category is awarded to the brewer who has done the least in 2011 and who really needs to get things going in 2012. I’m calling it the “Get your ducks in a row trophy,” and the winner is… (drum roll)… me! Hope you had a good 2011 and hope you have an even better 2012! I’ve had a few chances to play around with the Gueuze barrel chips now and thought I’d share my findings (on both grilling use and beer use). The Beer side: When I first opened the bag of chips I immediately threw some into starter wort to try and grow up the critters living on the chips. Not surprising, the bugs did get going pretty quickly. Also not surprising it developed some green mold. It looked and smelled decent for about 4 or 5 days and I thought that it might end up being usable. Then the aroma really went down hill and the green monster started growing. Oh well. I still haven’t dumped it out (too afraid) and I was thinking that I could possibly pull some of the beer out from under the mold and try to culture that up… but really, I’m too lazy for all that. Plus I like the reliability of buying pure strains and mixing them myself, or culturing up dregs from bottled beers. The Fire side: The chips have been used to add some smoke to pork, fish, and numerous chickens. Result… Shocker, the smoke flavor is just like oak! Well, to be fair I think there may be a slight difference that I haven’t yet been able to nail down, but unless you are going to do a side by side oak vs gueuze barrel (made from oak) smoke test, I don’t think anyone would pick up on a difference. 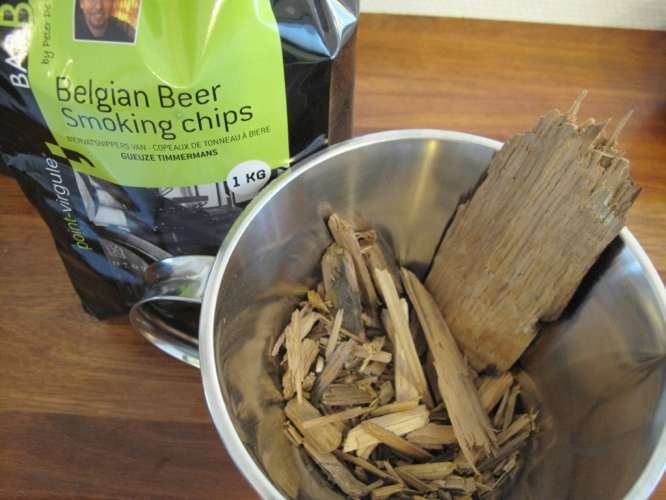 I actually do plan on doing that some time though (Bourbon barrel chips vs Gueuze barrel chips). That being said I do actually like using these chips. In general, they are chipped quite small and don’t need to be soaked too long before throwing on your fire. That makes them ideal for quickly adding smoke to items that aren’t slow-cooked for 60 hours. Also handy if you are “planning-challenged” like me and realize that you forgot to soak your chips as you’re about to throw the meat on the grill. I wonder if barrel chips from a good kriek would offer anything extra? Hey,Peter De Clercq, how about that? I’ll help test them out for you.! Every once in a while I feel like writing something a bit different. I could hop on the beer trend bandwagon and do pieces on beer and food pairings, but I find all that a bit ridiculous. Not the beer with food, that’s just logical to me, but everyone seems to be making this a “new” idea. Plus I kind of throw some of that into my cooking posts anyways. How about Beer and Mood pairings? A look at enjoying beer and matching it with a mood, atmosphere, event, music or whatever floats my boat. This will not be a regularly scheduled series of posts, I will just write something up whenever the mood strikes me (read that as probably not too often). “So what is your favorite beer?” It’s the dreaded question for most beery types. Many have some lame answer along the lines of “the next beer,” or “I haven’t tried them all yet,” or even worse they go off on a diatribe about beer styles. I don’t really mess around anymore. I throw out a couple commercial beers and a homebrew. One beer that always gets mentioned is Oerbier Reserva from De Dolle Brouwers. Despite my favoritism for lower ABV beers, this 13%ABV brew always tickles me in places I probably shouldn’t admit. Oerbier Reserva is a complex dark sour ale. Each vintage has its own variation on a theme of utter brilliance. I am always surprised with the all around balance, layered tart and funk, and the way it dances around my mouth doing back-flips off my tongue. 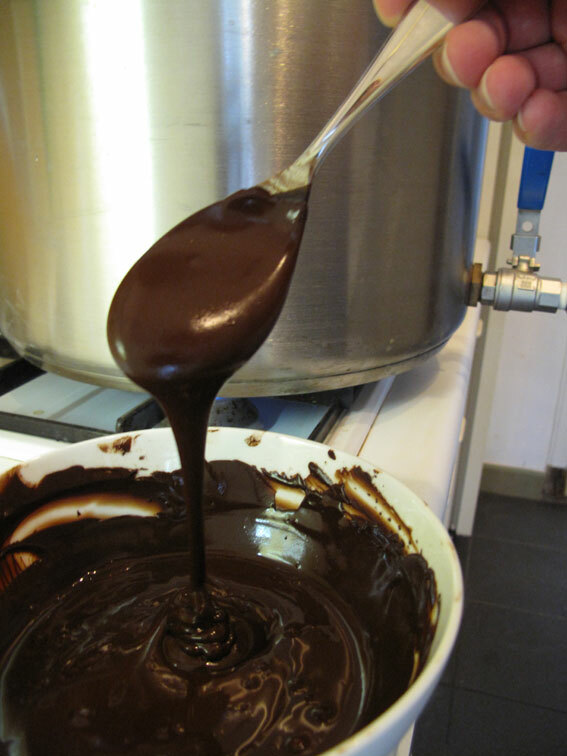 Dark fruit compote tainted with rich balsamic vinegar, infused with a hearty bordeaux, prodded by autumn spice, poked with tannins, and at times sprinkled with cocoa. That only begins to describe some of the aromas and flavors you have the privilege of discovering when drinking this beer. More simply put, it’s a damn fine glass of beer. Normally, big beers like to strut their stuff in front of a group of beer snobs, while they talk at length about its many facets and compare the various vintages. While I have definitely enjoyed a vertical tasting or two of this beer with like minded nerds, this is not the best way to enjoy it. Mrs. Smokey has a day job that involves thinking and all that smart stuff that I don’t have to worry about. Due to this daily brain-drain she tends to watch the more mindless programs on TV in the evening. The kind that normally make me fearful for the future of mankind… I’m talking to you Kardashians! While I detest these shows, it is at this time when I find my own bit of beervana. After making sure Mrs, Smokey has her cola I sit down in the corner of the couch and begin to pour the beer. Already the world starts to get a little foggy. As I lean back and put one arm around my wife and stick my nose in the glass, the world completely falls away. The only things left are the beer, my tastebuds, my wife and an occasional glimpse of the TV. At this point I can actually appreciate the hilarity of the intellectually challanged rich celebrity on TV (normally they just make me angry). It’s a bit of a secret moment. Since Mrs. Smokey doesn’t drink beer I feel no need to share or talk about the beer. Its all mine. No beer geekery to get in the way or take away from my moment of pure enjoyment. Brain-off, beer in. The flavors intermingle with the comfort of the couch and the warmth of Mrs. Smokey while the lighter side of life floats on by. One of the beer world’s greatest achievements paired with the worst that pop culture can throw at you. A real double rainbow moment in my head. The monks at the Sint-Sixtus abbey have been well know for brewing up some top-notch beers. 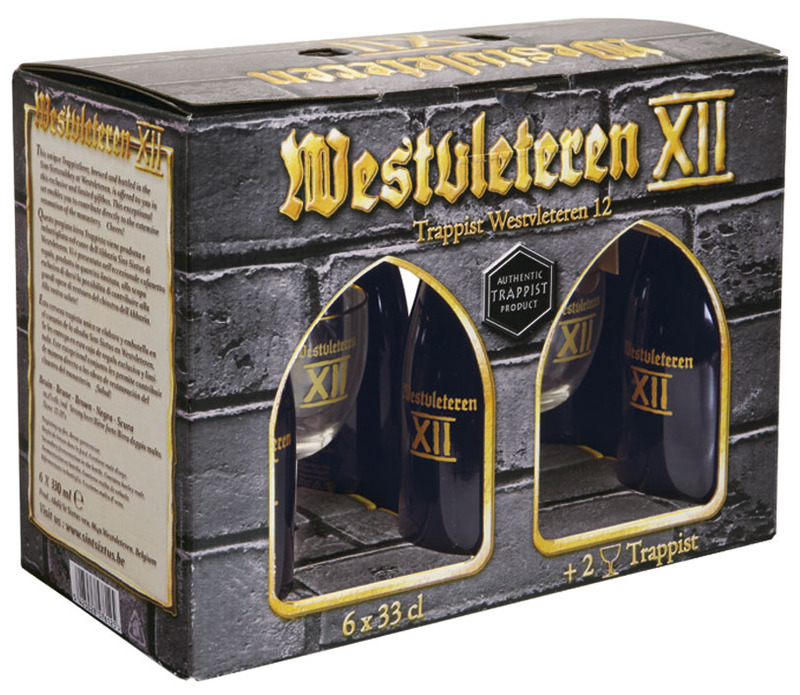 Look at any beer ranking site and Westvleteren 12 is sure to be close to the top. It is also one of the facts that every Belgian likes to spout at Americans who start talking about beer. That statement is then usually followed by something like, “much better than your Bud, eh?” Of course that proud Belgian has probably never tasted Westvleteren (or Budweiser) and if it’s not available at the corner store for next to nothing, he/she will never taste it. Of course there are people here who do care about good beer so I don’t let me paint too grim of a picture. Back to the cheap and wide availability of beer. About a year ago it was announced that the monks had struck a deal with Belgian low-cost-leading grocery store chain Colruyt to sell a limited release gift pack of Westvleteren beer. This was to bring in some much needed funds to renovate the deteriorating buildings of the abbey. 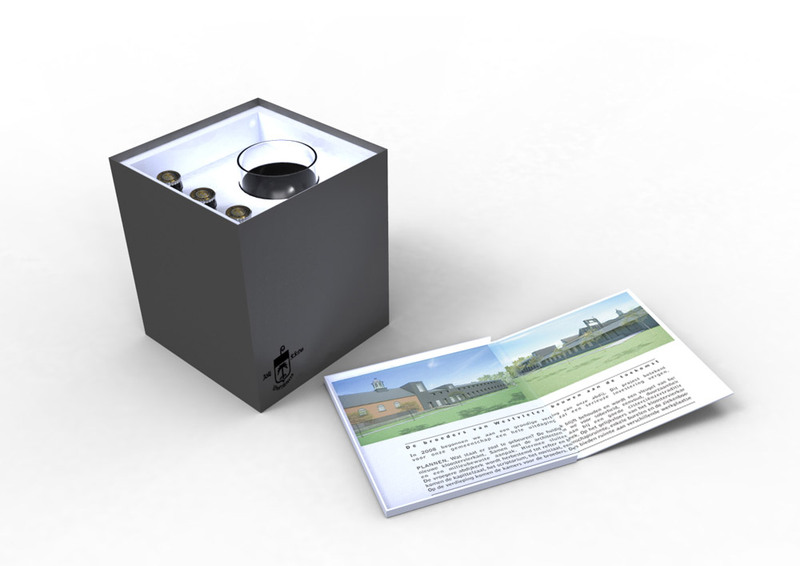 Seeing that Colruyt is a client of the product design firm where I work, my boss decided that I, being the beer guy and all, should throw together a quick concept for the gift box. A few hours later we sent our vision of how it could be done to Colruyt. Eventually they got back to us saying that they really liked the concept but said that the packaging had already been settled upon long ago. Oh well, it was worth the try. Someone must have thought “hmm beer, monks, and rebuilding. I’ve got it! Lets create the most uninspiring drivel we can think of and make this special fundraiser with one worlds most sought after beers into nothing more than a cliche. Brilliant! *” WTF! There was no thought put into this box. In this case, I know the beer will sell itself, but now it just seems like a silly marketing stunt rather than a worthwhile fundraiser for the abbey. 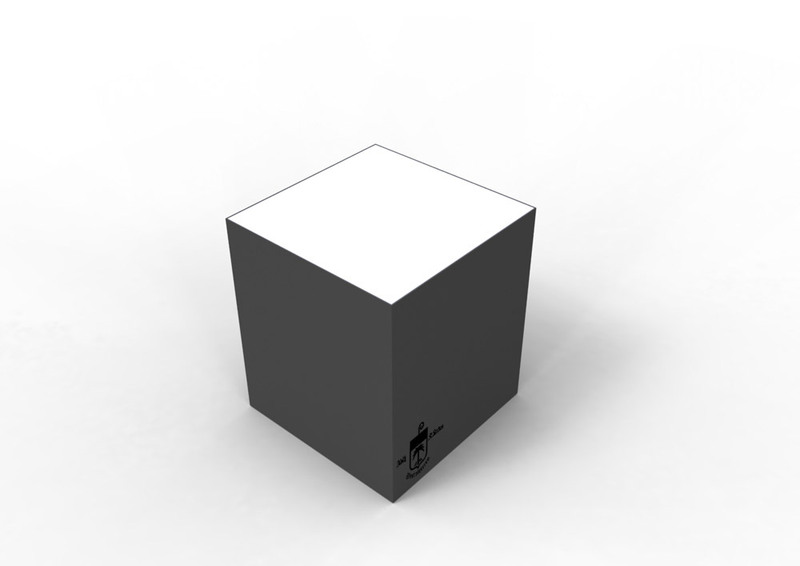 Ok, sure, the idea behind the box is a brick and by buying “bricks” you are helping to rebuild the abbey. Really? That’s the best you could come up with? And the over-used ye olde font and gothic arches? Oh right, they are monks and monks are religious and religion is old. Have you seen the plans for the new buildings? They are modern and sober and there are no effing gothic arches! In my not so humble opinion they really should have put some more thought into it and designed a package which links to what they are doing, sans cliché. I am not saying that my design (below) is the end all be all of monk-made-beer packaging, but it’s certainly no brick with gothic arches. Obviously I am biased, but sometimes I look at the state of Belgian Beer labels and graphics and just get pissed off at the level of creativity and care. I guess brewers here just take the nonchalant path and say that it is the beer in the bottle that counts and not the look of the label. True, in an ideal world that’s right, but here on planet Earth we can’t taste the beer through the packaging while we are at the store. The label is all we have to go by. If you see a beer with a beautiful label next to one with a crappy photo and some comic sans text, then you know which beer will be selling fastest (in this case I know the Westies will have no problem selling, but that doesn’t excuse the other 500 belgian beers with sh**ty labels). I also think it gives an impression of how the brewery works. If they care enough to put some time, effort and thought into a nice label then they probably don’t cut corners on the beer behind the label either. Of all countries, Belgium has the most exceptions to this rule. So many good beers get overlooked because their packaging looks like a 10 year old designed it.